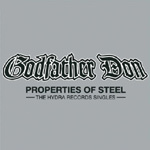 Properties of Steel contains every Godfather Don 12'' single on Hydra Records, originally released individually in the late 90s and early 2000s. Ten of these tracks have never-before been available on CD or digitally, and three of the tracks [''Stuck Off The Realness'', ''Status'' and ''Burn (Original Version)''] are from a legendary test pressing for a single that never made it to market, which fetches $300 plus on the auction market. This album is as much about the label, Hydra, as it is about the artist - Don's impeccable string of singles, released in the heyday of independent NewYork Hip Hop, was entirely recorded at the Hydra / Sneak Tip bunker, a subterranean fortress that housed a state of the art studio, and was frequented / favored by the Groove Merchantz, The Beatnuts, Joel Ortiz, Lakey the Kid (41st Side), Mobb Deep, Cormega, Screwball, Prince Poetry (Organized Konfusion), and many others. The studio / label had a string of 60+ releases, distribution deals with Tommy Boy and LandSpeed Records, a gold album (Screwball's Y2K) and rates high as an accurate document of the Queensbridge ''sound'' - streetwise and slang-rich, aka Cormega's The Realness. Properties of Steel features guest rappers Sir Menelik, Mike L, Big Lance, Prince Po, and RA the Rugged Man, and the album is entirely produced by Godfather Don.